Nestled into the lush green hillside only 3km from Skopelos town and the blue tranquil waters of the Aegean Sea. 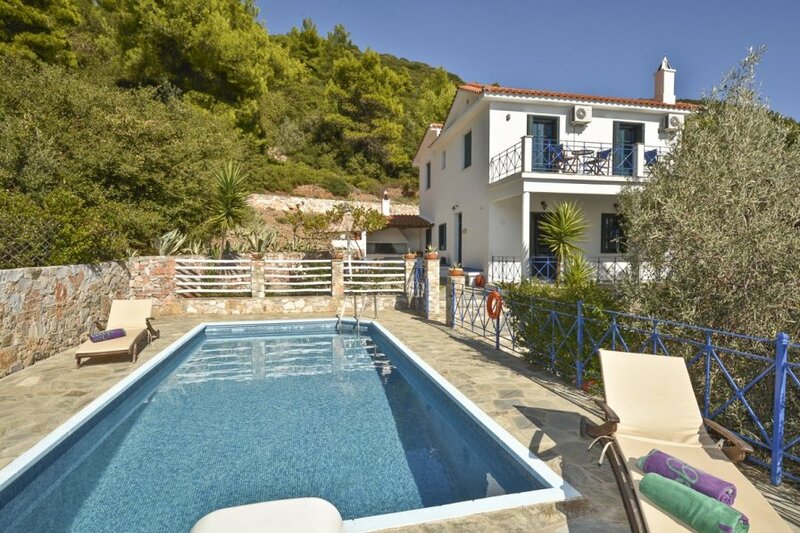 Nestled into the lush green hillside only 3km from Skopelos town and the blue tranquil waters of the Aegean Sea, this chic cottage getaway is the perfect haven for families or groups of friends who enjoy a peaceful countryside location with all modern comforts. And being less than a kilometer away from two of the Island's best beaches (Stafilos and Velanio) you are only minutes away from diving into those crystal clear waters! This charming and stylish cottage sleeps 6 people over 4 attractively designed bedrooms. As you enter you'll appreciate the light neutral tones of the cosy living area, with comfortable seating positioned around a traditional fireplace. Off this you'll find a well-equipped kitchen and dining area seating 6 people. On the same level there is a pleasant single room and separate bathroom with shower. Take the staircase to the upper level and you'll find another bathroom and 3 beautiful double bedrooms, all light and spacious, offering fresh modern decor yet lovely traditional touches. Two of these benefit from balcony doors that open out onto a fantastic sun terrace, from which you can enjoy your morning coffee whilst appreciating stunning views right out across the countryside and even Stafilos beach beyond. The last bedroom boasts a traditional wall-to-wall bed, and access to its own private balcony making this wonderful space ideal for retreating to after a long day exploring the local area. The exterior to this superb property offers the perfect space in which to while away the long warm Grecian afternoons. Surrounded by olive trees and a grape vine running the length of the terrace, with views over lush green vegetation, you'll feel truly secluded in this idyllic haven. A luxurious pool and relaxing sun loungers provide a heavenly antidote to the glorious sunshine. And a stylish dining area and BBQ mean that al fresco suppers can be relished on the balmiest of evenings.